Alexandra Kuykendall spends her days washing dishes, driving to and from different schools and trying to find a better solution to the laundry dilemma. All while trying to sneak in chunks of time to work on various writing projects. On staff with MOPS International (Mothers of Preschoolers) for nearly a decade, Alex continues as a regular contributor to MOPS's Hello Dearest blog. She is an established and trusted voice in mothering circles. Alex lives in the shadows of downtown Denver with her husband Derek and their 4 daughters. She is co-hostess of the annual Open Door Retreat and speaks to women's groups around the country on issues of parenting, faith and personal growth. From church basements to the set of Good Morning America, Alex offers women grounded perspective on how to approach the "crazy busy" in front of them. Find out more about the retreat at TheOpenDoorSisterhood.com or connect with Alex at AlexandraKuykendall.com. Loving our neighbors. We all know that as Christians we are called to do just that, but surely God didn't mean ALL of our neighbors, right? I mean... some of our neighbors can be... well, hard to love! We all know the ones, right? The ones that are loud and obnoxious, the ones who leave the yard a mess, and the ones that have that dog that just cannot stop barking. Are we supposed to love them too? YES! Absolutely. With the state of our world today where arguments can happen over the slightest of disagreements, loving those close to us- even those we don't agree with- is more important than ever! But... how do we actually do that? This book is a great place to start. It really challenges us to look at our own hearts and see how we can better love the people around us. Each chapter offers up a practice that will help us in doing so. It gives real world stories mixed with scriptural references to truly get us to stop and think. But we aren't just reading through. Each chapter ends with a scripture to digest, a series of questions to help us reflect on what we have read and where we are now (and where we want to be), and real world ways to put these practices into practice. I love that this book isn't just saying, 'We need to do this...', but instead is actually giving us ways to do so! We all need that encouragement and inspiration sometimes, don't we? At the end of the book there are even MORE ideas for putting the practices to work, separated by the previously mentioned practices. I loved this because it can be flipped to quickly when we need a burst of inspiration rather than searching throughout the previous chapters. It also offer tips for connecting with families throughout the year, ways to love your home bound neighbors, and reasons to have a block party. This truly was a great starting point to better help us grow in the area of loving our neighbors just as God intended for us. It was a great read and one that I would certainly recommend. 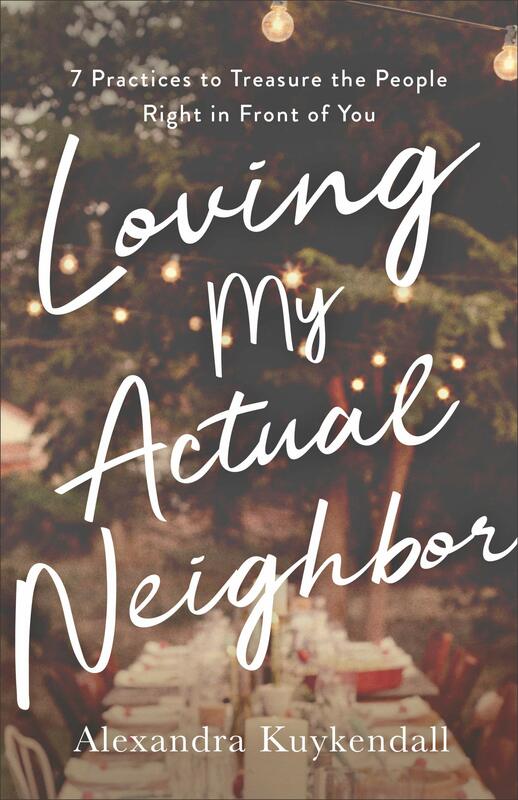 'Loving My Actual Neighbor' is available to purchase now at your favorite Christian book retailers. Nice post.Thanks for the review. You have shred a good description of the book. I have got a clear idea of the book. I haven't read it yet. But I really want to read it soon. Because it sounds good. Reading the book would be a good experience. I love reading new books. Glad to visit this site. Keep on sharing more posts like his. Really looking forward to reading new posts.